Two of the best things in the world at the same time: Steak with Chilli Chocolate Sauce! I hope you haven’t given up meat or chocolate for Lent because you’d be missing out, big time. Carnivores rejoice. Chocolate lovers rejoice. The double whammy has arrived. 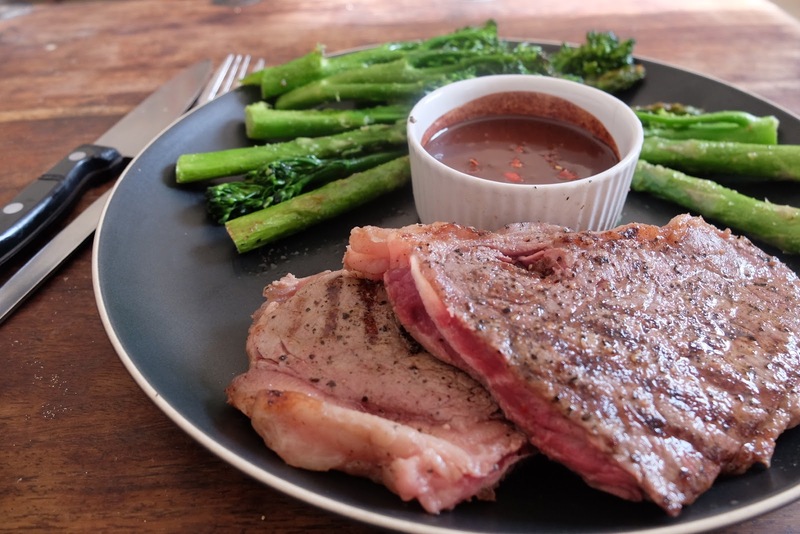 Black pepper encrusted steak meets with a heat infused chilli chocolate sauce, served alongside juicy, grilled tenderstem and asparagus. Steak and Chilli Chocolate Sauce? An unusual pairing, absolutely, but bear with me. Steak is one of the finer things in life, as is good quality chocolate, and why shouldn’t we combine the two? Bloody, rare meat, encrusted with black pepper, meets a bitter yet tantalising dark chocolate sauce that has been infused with bird’s-eye chillies. The result? A striptease on your tongue. Add this to your Easter Sunday menu because it will quite literally blow you away. You could even serve this around valentines day for maximum euphoric effect, or you could just do it for yourself as a special treat – because you know you’re worth it. Cacao was hailed by the Aztecs as the food of love for centuries. In ancient ritual, cacao was a metaphor for the heart torn out in sacrifice – the seeds inside the pod were thought to be like the body bleeding, and chocolatey drinks were often dyed blood-red to emphasise this point. Good quality chocolate, or even Paleo chocolate alone, is difficult to come by so when you do discover some that ticks all of your boxes, stock up! It’s worth having some in your cupboard for use in sweet dishes, snacking, and even in savoury recipes like this one, which is a bit of a swerve ball! The sauce itself was quite bitty from the cacao nibs but that wasn’t an issue; if anything, it added to the texture of the overall dish. If you want a smoother sauce you could cook some cacao nibs in some water over a low heat, and blend with maple syrup and sea salt. The chopped chilli permeates the sauce with an intense heat, which you can vary according to preference, just remember that a little goes a long way and to wash your hands in cold water afterwards! Although the chocolate itself contained sea salt, steak asks for generous seasoning in order to realise it’s untold flavour potential – so don’t be shy with black pepper and extra salt if you can allow it. Serve with seasonal greens, sautéed in garlic butter for the ultimate classic steak pairing. But now the evenings are drawing out, you do have license to sit outside, embrace spring, and team with a large green salad, doused with plenty of balsamic vinegar, and some cherry tomatoes. The chocolate sauce will serve two, and is best contained in ramekins for dipping, in order to limit how much you really want to fire up your meat!